Suppose you have an interface defined in C#. What is the easiest method to find all classes that provide an implementation of the interface? 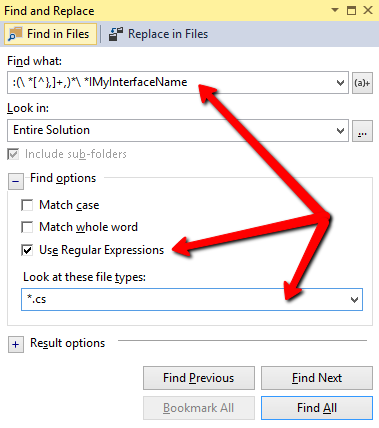 The brute force method would be to use "Find References" in Visual Studio and manually look through the results to separate out the usages from the implementations, but for an interface in a large codebase that is heavily referenced with relatively few implementations, this can be time consuming and error prone. In Java, running javadoc on the codebase (using the -private option to include private classes) would generate a documentation page for the interface (e.g. Comparable) that includes all implementing classes for the interface as well as any subinterfaces (though it doesn't include implementing classes of the subinterfaces, these are relatively easy to determine by drilling down into the listed subinterfaces). 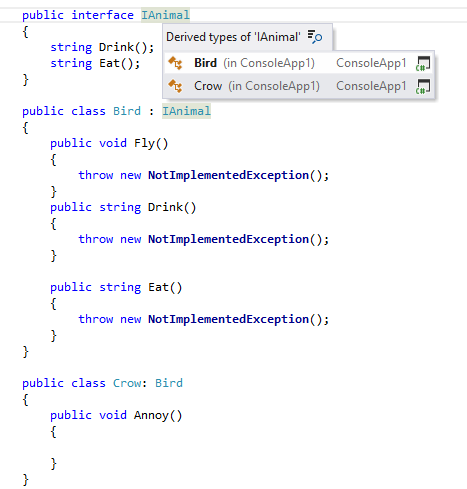 It's this functionality that I'm looking for but with C# and Visual Studio. You can use Reflector, which is able to show you all the type hierarchy very easily - just under the type name are expandable items for base types and derived types. Similar tools are available such as ILSpy and dotPeek. You can right click a method name (definition in interface or implementation in other class) and choose View Call Hierarchy. 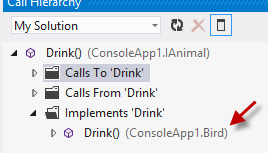 In Call Hierarchy window there is "Implements" folder where you can find all locations of the interface method implementation. Right click a member method and choose view call hierarchy. Expand the Implements folder. This lists all the types that implement the interface the method belongs to. Right Click the interface > Navigate To > Derived Symbols. The symbols listed in bold derive directly from the interface. Non-bold symbols derive from a superclass. For those using Visual Studio 2015, there is this awesome extension called Go To Implementation. Give it a try. Once you've installed the extension, you can just right click at any occurrences of the interface (e.g. IUrlShortener) and click on Go To Implementation menu. If you only have one class that implements the interface, clicking the menu will bring you directly to the class. If you have more than one class that implements the interface, it will list all the classes. Go To Implementation. The feature many of you have been waiting for: just right-click on an interface or abstract method and select this command to navigate to the implementation. I don't think this functionality is inbuilt into VS but IIRC Resharper has this. You could do a regular expression search for the interface. Doesn't show all references like "Find All References"
Use Shift + F12 to show all references, including the definitions. If you use resharper ALT + END shortcut might help to find all Inheritors. I've heard tell (no experience myself) that doxygen is to .Net as as javadoc is to java. Not the answer you're looking for? Browse other questions tagged c# visual-studio resharper reflector or ask your own question. How do you quickly find the implementation(s) of an interface's method? How can I find all the classes which implement several interfaces at once? Recognize Disposable Objects in Visual Studio? How do you find all implementations of an interface, in code?